It’s been awhile since I’ve read a book that really got me excited about being a pastor. Not that I don’t like being a pastor; that isn’t it. But David Lose‘s Preaching at the Crossroads reminded me of the privilege that it is to serve as a pastor, and reading it got me excited again about preaching. While I’ve been doing some pretty standard preaching (with a few exceptions) for the past couple years, and I certainly haven’t strayed from my manuscript since coming to Winnetka Presbyterian Church, I really believe we need to rethink the whole preaching enterprise, and reading Lose’s Preaching at the Crossroads only solidified that belief for me and got me excited to start working on figuring out what a new model of preaching might look like for me in my current context. Let me be clear: the point of this review is to get you to buy the book. If you’re a pastor, or involved in parish ministry in any way, I think you need to read this book. If you know a pastor, this would make a great gift or stocking stuffer for her or him. 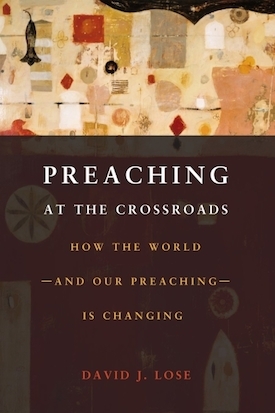 I’ll share a few thoughts about the book, leave you with a few solid quotes from Lose’s book, but in the end, you’ll be better served by just buying the book and really digging into Lose’s call for rethinking preaching in light of our changing world. It has also got me interested in revisiting those who have written about this idea of moving toward a more participatory sermon in recent year. Lose mentions specifically John McClure, Lucy Rose and Doug Pagitt. Lose argues that in a world that is being changed dramatically by postmodernism, secularism and pluralism, we need to take a step back, and really look at our method of preaching. He writes, “For if we continue to embrace patterns of preaching designed and suited for a bygone age, then we probably shouldn’t be surprised if the new age in which we live continues to pass us by” (5). Lose briefly summarizes some of the primary elements of postmodernism, secularism and what he calls digital pluralism, and then reflects on how the preacher might respond in light of these cultural changes. Not that we would be fighting against these forces in our world, but rather how we can use them, and see the opportunities that they provide for preachers to present the good news of the gospel in a way that actually makes a difference in the lives of the people in our congregations. A large focus for Lose is attempting to reclaim the practice of Sachkritik, which is interpreting the whole of Scripture in light of its central content and witness. Sachkritik is a practice that has had many critics, many claiming that one is simply approaching each and every text with a meaning already decided that the preacher can be tempted to simply read into the text. But Lose’s critique of that view is that it comes from thinkers who are steeped in modernity and have a need to see each text only as only having one meaning, and then if we bring our thoughts and experiences and biased hermeneutic to the text, we are not honoring each text for the meaning that resides in it. Preaching the Bible from the center simultaneously allows room for, and holds accountable, the ineluctable role of our own biases, vested interests, and predispositions. Reading and preaching the Bible from the center avoids the fragmentation of the biblical witness into a series of discrete parts. Preaching the Bible from the center reminds us that our interpretations, along with all of language, are productive and even powerful, rather than merely descriptive. A postmodern practice of reading and preaching from the center stresses a corporate, rather than individualistic, approach to Scripture. The emphasis on the communal nature of hermeneutical criteria invites us to a broader vision of “meaning” itself. It interpretation is communal, it will also be contested. Reading and preaching the Bible from the center preserves Scripture’s status as the divine word of God even while taking seriously the “incarnational” element of Scripture’s composition, transmission, reception, and interpretation by fallible humans. This approach to biblical interpretation gives the preacher something to say with conviction. “Preaching, from this point of view, is meant to be provocative, eliciting conversation and questions, faith and disbelief, but always striving to make a claim worth responding to. In this way, the preacher comes not as the trained expert designated to give a guided tour of an ancient text – let alone perform a postmortem on a dead confession of faith – but rather as an experienced guide and host who makes claims, suggests lively interpretations, makes a wager about the present-day meaning and interpretation of a passage, and ultimately, invites the hearer not just to take these claims and confessions seriously but also to respond to them in word and deed” (45). “The world just changed, and we haven’t really changed with it. The world offered us so many other places to look for meaning and significance and identity, often in intriguing, challenging, and compelling ways. But we continued to offer Sunday school and confirmation as if there were no other options. We continued to do worship as if folks have nowhere else to go. And we continued to preach as if our people already know the biblical story and just need a little more instruction and inspiration to live it” (98). Lose discusses the difference between a performative homiletic and a participatory homiletic, and I think he makes a great argument for the need to creatively think about how we might be able to engage our congregations more with the work of preaching. “…it’s not that a performative homiletic is wrong; artful interpretation of the text is only to be esteemed. Rather, the performative homiletic is simply insufficient in and of itself to the demands of the day and therefore must be supplemented by a homiletic that invites, nurtures, and expects a lively interaction between hearer and text” (106). The participatory homiletic is the direction I would like to move in my own preaching, and had some success with it when I used it in Ashland. Participation within a sermon can take many forms, although the times I enjoyed it the most was when I would actually ask questions of the congregation in the middle of the sermon, hear people’s thoughts and perspectives, respond to them, and then continue, keeping those new thoughts and perspectives in mind. I would be interested to hear what some of my preaching friends think about these ideas, specifically after they’ve read through Preaching at the Crossroads. I think Lose does a great job walking us through the current climate that exists for those of us doing parish ministry, and gives us all some great things to think about in terms of ministry as a whole, and preaching specifically. You can pick up a copy today here. This post is part of the Patheos Book Club. Visit here for more reflections on Lose’s Preaching at the Crossroads. This is a great read. Just completed a graduate course in Pop culture and Preaching language and Lose was a major contributor to our studies along with Laytham and Turner.